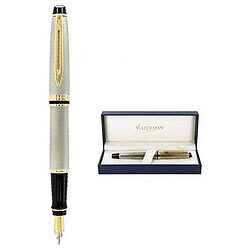 Deliver your message to your loved ones with this gift of Elegant Waterman Expert Stainless Steel Gold Trim Fountain Pen with Wonderful Features and make them feel special. You can enjoy the Pen with its Fine Gold plated Nib, Satin-Finished stainless Steel Cap and Barrel with Ultra Contemporary Vertical Brushing. It is nicely presented in Gift Box.